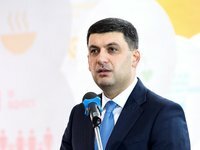 The revenue and expenditure targets of the national budget 2018 will be met, Ukrainian Prime Minister Volodymyr Groysman has said. "The revenue and expenditure targets of the 2018 budget will be met," he said at a presentation of the draft national budget for 2019 at a government meeting on Friday. The prime minister said that the 2019 budget will retain financing of programs started in 2018. In addition, he said that inflation in the country in 2018 would be 9.9%.